I like to have a good relationship with regulators. And believe me I have tried really really hard with the FCA. I didn’t have much of a relationship with the Pensions Regulator in the past. 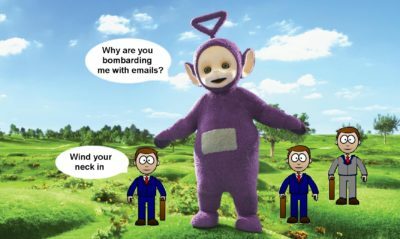 I asked for a meeting with Tinky Winky, tPR’s former executive director. He turned up with two lawyers (in case one blew away I guess) and a paralegal in an aptly-named conference room called the Warwick Suite at a hotel at Gatwick airport. Winky accused me of bombarding him with emails (about the Capita Oak scam). I counted them: 16 over an 8-week period. My calculator said that was approximately two per week. Then he threatened me for “tipping off” and said I could be prosecuted; then the uglier of his two lawyers threatened me with unspecified action if I didn’t wind my neck in. She said to me in a rather unpleasant manner “we can have you sent to the Tower you know – we have wide-ranging powers”. Anyway, our little tea party in the stuffy room didn’t exactly make for a good spirit between us. So I sighed a huge sigh of relief when Winky departed tPR a year or so later and went to work for LGPS (one of the ceding providers who had performed so appallingly in Ark, Capita Oak and Westminster – handing over £ millions to the scammers without batting an eyelid). I am happy to say I have a good relationship with Lesley Titcomb – Head of tPR – and am grateful to Henry Tapper for facilitating this. 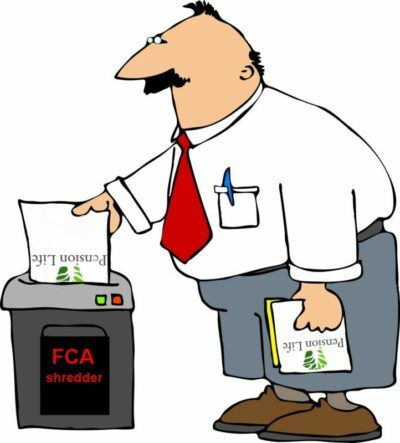 But, back to the FCA. I went to see John Thorpe at the FCA a couple of years ago – with a rather thin colleague of mine who is a Chartered Financial Planner. John was very enthusiastic about working with us and asked me to give him any intel I had on scams and scammers. He said he would ensure all information would be passed on to the relevant people. However, he did warn me not to deluge him with emails and said: “not more than two or three a week please”. But then John got moved to another department, which was disappointing. 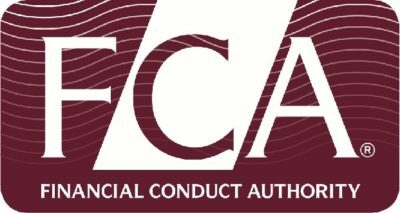 Since then I have sent dozens of complaints to the FCA – as have a number of my associates including IFAs, trustees, compliance officers, chartered financial planners and victims. But the firms in question are left unsanctioned. And the non-compliant practices continue unabated – and more victims are ruined on a daily basis. In 2016, Jeremy Donaghy-Sutton (a senior airline captain and safety instructor) and I got together in London. He suggested we propose to the FCA an air-crash-style investigation and reporting system to analyse the causes of scams, prevent them from recurring and taking the appropriate action against those responsible for failures. Mostly his brilliant work, we finished and printed off our proposal and set off for the FCA offices. I had called ahead and told them we would be coming and that we would like to hand our proposal, report and a series of complaints to an appropriate person. I said it was important that we had a brief chat so that we could explain the purpose of our visit (me plus an actual victim) and the accompanying documentation. We got to the FCA’s North Colonnade office and went to reception. There I explained who I was, what I wanted, who and what I had with me. A very pleasant lady, flanked by two security guards, said “Oh, but we don’t see people here”. Her English wasn’t too bad, but I did wonder whether she hadn’t quite understood what I had said. So I tried again, and went into some detail about the fact that the person I had previously spoken to at the FCA had said that someone would indeed come down and see us. But her English seemed to get worse the second time. And she still insisted that nobody would come to see us and accept the documents. I tried a third time, while Jeremy sat in the waiting area chuckling quietly as he could see and hear my fuse getting shorter and shorter. This time the nice lady said she would get someone to speak to me on the phone and asked me to sit down for a few minutes while she got through to somebody. Jeremy and I sat watching the ghastly moving picture on the reception wall – and I wondered what on earth had inspired such a weird and inappropriate piece of “art” (and what the artist had been on at the time). After about ten minutes, I was summoned back to the reception desk and the nice lady handed me a phone. I have no idea who the man on the other end of the line was, and not much idea whether he was speaking in English or some weird combination of Mandarin, Yiddish and Czech. When I eventually got my head and ears around his weird accent, I realised he wanted me to explain – over the phone – who I was and what I wanted. 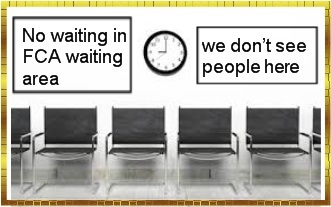 By this time there were about twenty people hanging around in the reception area – so this extremely confidential complaint and report proposal was announced loudly and publicly as my voice got higher, squeakier and louder. I had to spell out some words several times as the man’s English seemed to get worse as the agonisingly painful conversation dragged on and on. When I had finished, exhausted and wondering if this was all a bad dream, the man said “OK, hand your documents into the post room”. We duly dropped the bulging envelope into the tiny little room just outside the entrance to the FCA building. I assume it was all shredded as we never even got an acknowledgement. Afterwards, over a quick lunch in a Thai restaurant just up the road from the FCA, Jeremy and I wondered if what had happened had all been just a bad dream. How could such a thing happen in a supposedly civilised and well-regulated country. But then Jeremy himself had spent the past five years wondering how the Ark “thing” had been allowed to happen. The very things I warned about back in 2016 are still happening and victims’ pensions are being routinely destroyed – both in the UK and offshore. At the Transparency Task Force Symposium in November 2017, one victim stood up and related a remarkably similar story to mine about his treatment by FCA. The delegates – who included pension trustees, solicitors, police officers, victims and the wonderful Andy Agathangelou – were stunned and disgusted. So, if anybody knows anyone at the FCA who might like to do a bit of regulating no more than twice a week, could they please let me know? A bizarre tale but not surprising given the FCA are allowing scams to continue unabated. It’s why the scammers treat the authorities with utter contempt and laugh all the way to the bank when victims make threats to report them. I get similar treatment from the DVSA (Driver & Vehicle Standards Authority) who regulate my industry. They are institutionalised and full of their own perceived importance. Yet individually they must be human, but once behind their desk they undergo a mental transformation and become inhuman. It is truly disgusting. No one cares.